Taking a brief detour from “My journey to Linux”, I wanted to overclock my Geforce GTX 760, as I had done the same on Windows. Caution: Overclocking will void your warranty and could fry your graphics card. Continue at your own risk! After this you have to reboot the PC. 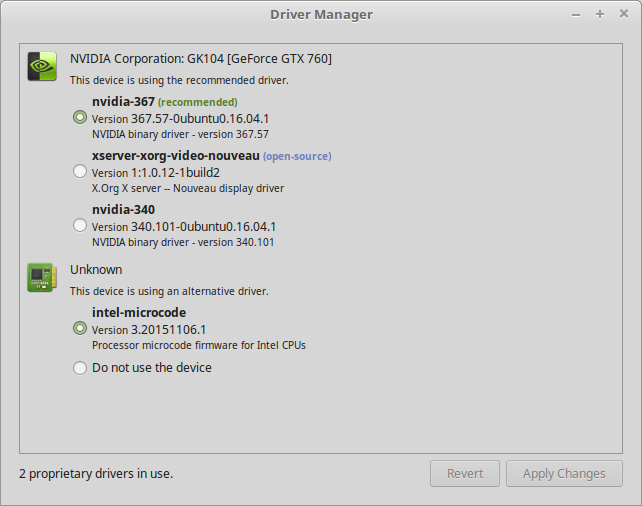 After the reboot start the NVIDIA X Server Settings application, and go to “PowerMizer”, here you can enter offsets for both the core and memory for your graphics card. 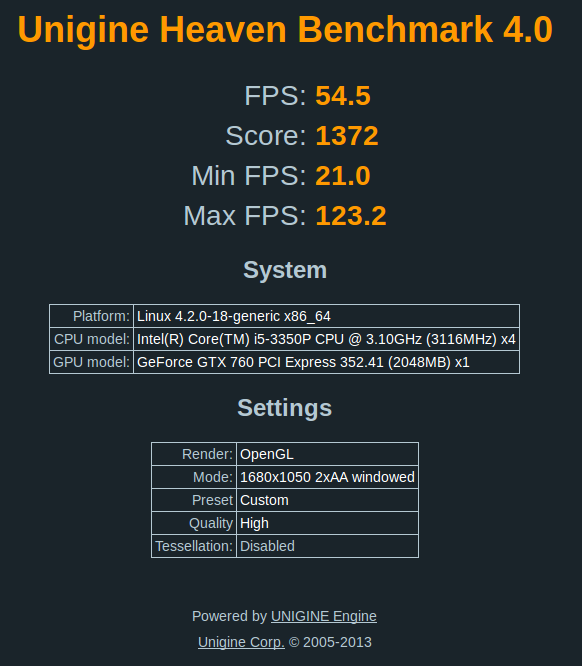 Start by downloading Unigine Heaven from their site: https://unigine.com/products/benchmarks/heaven/ – it has a big download button on the frontpage at the time of writing. Once downloaded, do a chmod +x Unigine_Heaven-4.0.run to be able to run it. With heaven running, I moved NVIDIA X Server Settings to my secondary monitor, and simply started tweaking the settings – constantly looking at heaven for artifacts. Always find the maximum safe clock for EITHER core or memory first – don’t increase both simultaneously or you wont know which one causes issues, once you hit a wall. I went with 50mhz steps for memory first, increasing it by 50mhz, waiting for around 10 seconds, increasing it again and so forth. Eventually I noticed artifacts in the form of oddly colored rectangles popping into the image every once in a while. This was when I’d gone too far. I backed down the clock by 50mhz until these disappeared, and noted this as my safe memory overclock. Then I dropped memory overclock back to 0mhz, and did the same with core – although only increasing by 10mhz at a time here. Once you get too far with core overclock it’s likely your system will hang. You will have to flick the power switch or use a hard reset button to reboot it. Now you know what’s too much – I’d then subtract a few steps (like 20-30mhz) from that value, and run a couple of benchmarks in heaven to see if it’s stable. For me my GTX 760 crashed at 90mhz core overclock, so I went the very safe route and stopped at 50mhz since the last few mhz didn’t really give much improvement. Memory started causing artifacts at 1500mhz overclock, so I went with 1400mhz as my safe value. Then I ran a couple of benchmarks to ensure it was stable. Finally to automatically apply these settings at boot, we have to do a bit of manual work. The nvidia X server settings doesn’t support loading overclocks, so I went and created a simple bash script, and added it to startup applications. [gpu:0] means to apply the setting to my primary graphics card, if I had two I would use both [gpu:0] and [gpu:1]. GPUMemoryTransferRateOffset is how much I want to overclock the memory. 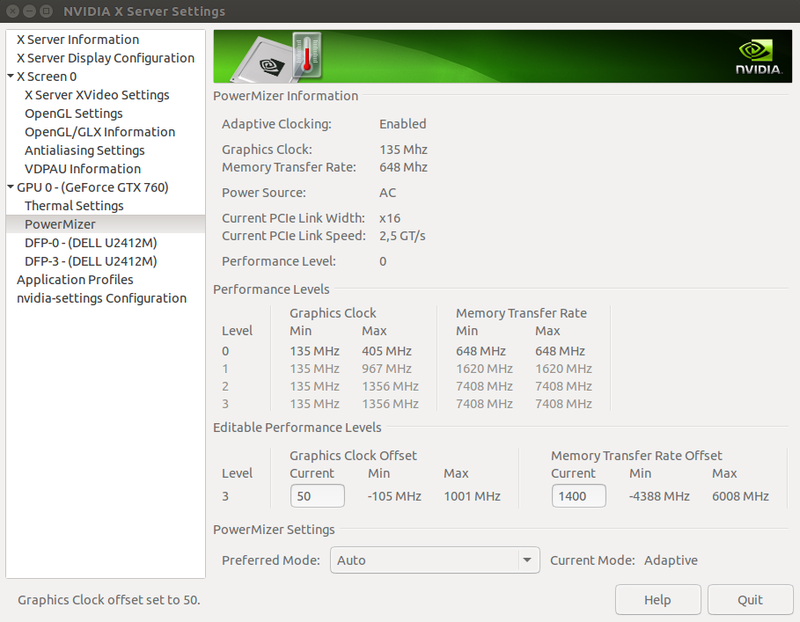 GPUGraphicsClockOffset is how much I want to overclock the core. 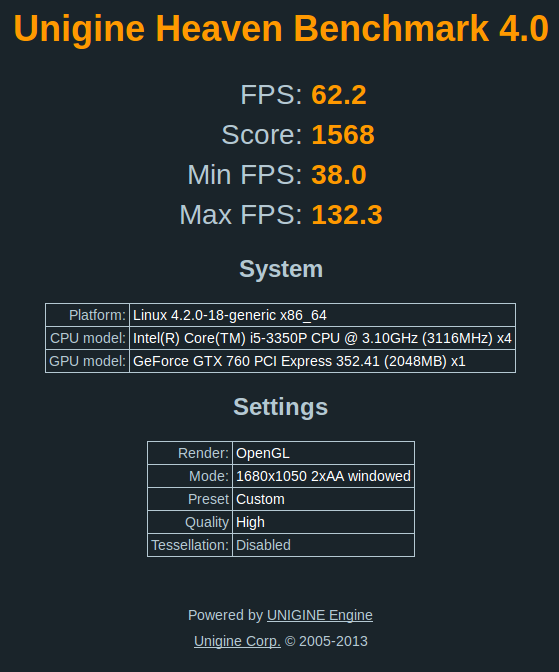 means to apply the overclock to “performance level 3” of my graphics card, this is the level a GTX 760 will utilize for running games. The lower levels are used when just browsing etc. 1400 and 50 are the mhz values for each overclock value.